One of the best wilderness whitewater rivers, the Middle Fork of the American, features numerous Class III and some technical Class IV rapids in a beautiful 2000-foot deep rugged canyon. This river is appropriate for active, athletic individuals - both those who rafted before as well as adventurous first-timers. Class II & III rapids interspersed with quick, jolting Class IV drops. 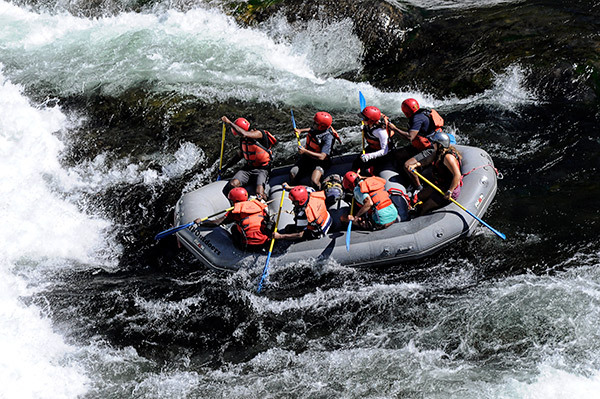 The Middle Fork's Class IV rapids are literally famous, having been featured in many motion pictures. Their cinematic reputation is well deserved–they are built of chutes and large drops that appear intimidating but are actually quite forgiving. 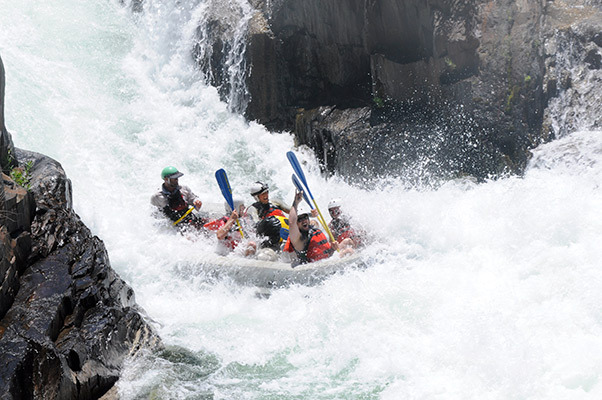 The Middle Fork's most well known rapid is Tunnel Chute–a steep and narrow chute of frothy whitewater that crashes over a 6-foot drop and then through a 90-foot long rock tunnel! Halfway through the trip, a calming Class II section allows paddlers time to relax and play in the clear water. The final stretch of river begins with a sharp 5-foot drop and an intricate portage of an unrunnable Class IV waterfall. We end in a long succession of exciting Class III-IV rapids. The 2000'-deep and secluded Middle Fork canyon is worth the trip in itself. Though you will find historic remnants of the California Gold Rush in the Middle Fork canyon, what you won't see are houses. This is a remote wilderness area. Oak and pine trees cover the canyon walls while willow and wild grapevines decorate the riverbanks. During the spring, golden poppies and purple and pink lupine dot the landscape. In the summer, juicy blackberries lie plump on the vine and their sweet scent pervades the air. Any trip through this beautiful canyon represents a significant break from everyday life in the city. 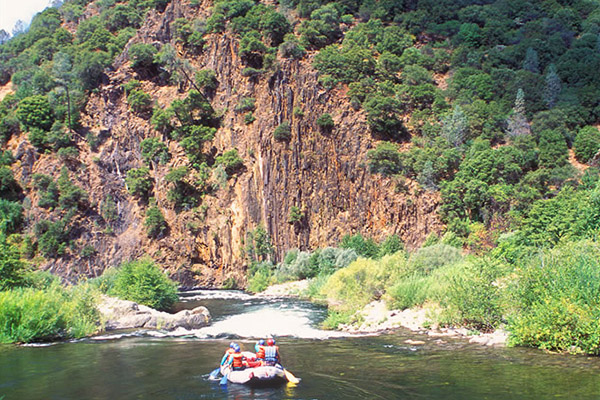 The Middle Fork is just 140 miles east of San Francisco and just 50 miles east of Sacramento. Interstate 80 is 17 miles from the All-Outdoors Middle Fork meeting place, making your commute easier and faster. The Middle Fork is dam-controlled - in fact, we put-in right at the base of Oxbow Dam. Because the river's flows are regulated, its levels are extremely consistent seven days a week. 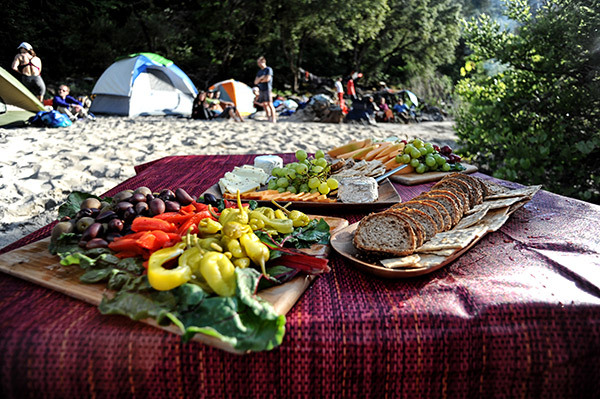 On 1-Day trips, our lunch begins with tortilla chips, salsa, and fresh summer fruits. Our gourmet "build-your-own" sandwich bar includes all the fixings needed to assemble the perfect sandwich to your preference. We also provide a beverage, and cookies to finish it off. Breakfast, dinner, and both lunches are provided on our multi-day trips. Our breakfasts vary from fancy continental-style fare to omelets cooked to order. At dinner you'll dine on hors d'oeuvres, tossed salad, garlic bread, baked potatoes and main dishes like grilled chicken and steak. And don't forget dessert-a freshly baked Dutch oven delight (fire season permitting)! All-Outdoors runs paddle-rafts on the Middle Fork. In a paddle-raft, each guest and a professional guide have a paddle and navigate the river, working as a coordinated team. 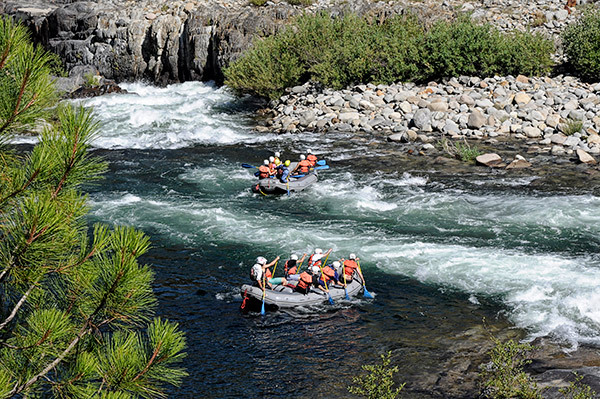 Middle Fork trips are highly participatory so guests need to be ready and willing to paddle. All guests should be able to swim. Highly Recommend This Trip and All Outdoors! "Excellent experience all the way. All Outdoors is very organized and efficient. Top notch folks. The trip was as described on the website and was very exciting. Our guide, Dane, is a fine young man. Very knowledgeable about the river. The food was good and plentiful. We plan to return in the future."